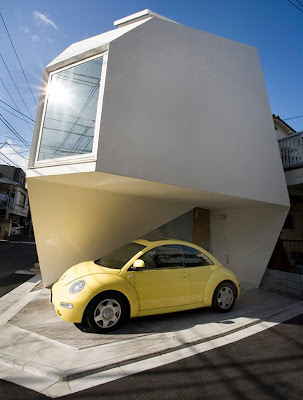 This building is a reflection of Mineral House, located in the city of Japan, "Atelier Tekuto",this building designed by architect Yasuhiro Yamashita, the building looks really small but very sweet residence measuring it at just 480 sq. 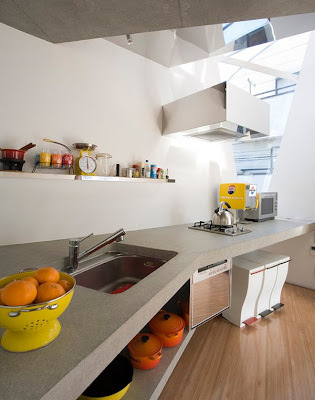 The picture of elegant Japanese modernism, the architect’s have a vision about alive with every twist and fold of the home’s striking silhouette, which appears to balance on a single point at its base. Inside, the home’s fabulous form dictates the wonderfully shaped rooms and the way light hits every angle. A minimal white palette and natural wood floors keep the focus where intended – on forms.